Dental CT Scan enables us to select the best location for your implants and plan the details of your surgery with pinpoint accuracy, well before the operation. Routine dental x-rays are two-dimensional; they only show the location of your teeth and the height of the bone. These x-rays are often distorted, and they cannot depict the thickness of your jawbone. A CT Scan, on the other hand, is distortion free. It illustrates the density of the bone and provides three-dimensional and cross-sectional views of your jaws. These images allow us to accurately measure the amount of bone that is available for implants. So why do I need a CT Scan? A CT Scan help us dentist determine whether you are a good candidate for implant surgery. This can save you an unnecessary operation. Because the scan tells us a lot more than conventional x-rays, it helps to prepare for your surgery. A CT Scan means we will know the exact location of anatomical structures, the contours of the jaw bone, and the best sites for your implants before surgery. That means less operating time, and fewer complications for you. Do I need to do anything special? And what will happen to me during the CT scan? You do not need to prepare for the CT scan. You may be asked to remove any jewellery from your head and neck so that it does not interfere with the scan. Once in the examination room, all that you have to do is keep still for those few minutes that the scan takes so that clear pictures are obtained. We will provide you with a mouthpiece to bite on; this will separate your jaws and help you to keep them still. You will not feel anything and in less than 15 minutes you will be finished. 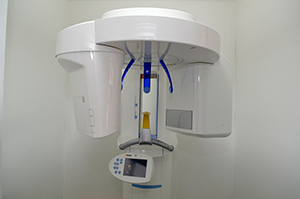 The Cone Beam Computed Tomography (CBCT) scanner is compact in size and the relatively low radiation dosage of the CBCT scanner makes it ideally suited for imaging dental structures.